This time of the year, in the month of February I visited a friend of mine studying at Chautara Campus in Sindhupalchok. He had invited me to spend some days with him and I accepted his invitation because I knew that we had not seen each other for a long time so going to meet him and spend some time was definitely a positive change. I took my own vehicle with a driver, packed my luggage with a small present for him. I left home early in the morning, the journey was pleasant. The 68 km. road distance with stops in between at lodges for meals and snacks then again a few hours drive with music from the car and passing views outside made the journey uplifting. Sindhupalchok is one of the seventy five districts of Nepal.The headquarter is in Chautara. My friend had promised me that he will take me to some of the famous landmarks during my stay and I was eagerly looking forward for this time. Finally we arrived at Sindhupalchok district, I went directly to his school and to my delight he was available for me. He was there with a broad smile in his face. I went and met him, he hugged me and together we went to his home which was nearby his school. That evening we spend time chatting about lots of things few from past days and enjoyed each others company afterall we were good friends. I remember having the best home cooked meal at his home and Uncle and Aunty were also happy to see me in their home. Next morning, we went out for excursion to some of the viable places in Sindhupalchok. I was into bits when my friend told me how badly it was struck by the earthquake in 2015. There was a colossal damage to the place and people. Sindhupalchowk had health posts, a district hospital, I wish there was more facilities so that more people were treated and emergency rescue and operations were available abundantly in such a sensitive area. My good friend took me to some of the beautiful places and we enjoyed spending quality time knowing about the significance of those places. He showed me Bhairav Kunda, Panchpokhari, Gaurati Bhimeshwor temple, Shiv temple, Kali temple, Jugal himal, Kubinde. I was in love with this places, the place was green and calm. Cattles grazing on green pastures, hilly slopes, landscapes of Dadhi gaura bhir, Chautara scenaries, terraced lands were all monumental for me.The place that was unique for me was Paanchpokhari and Bhairav Kunda. We reached Chanauti starting out with few days trek Paanchpokhari where there were pristine 5 ponds at close proximity with each other. It also has religious significance during Janaipurnima. When we got there the scene was fascinating. The sky and waters were same colour because of the reflection in the water. I had never seen all water reservoirs in same place ever before. We came to our place in the late evening and we felt tired after hiking. Once again we had our dinner, Uncle’s understanding of his homeland was very infectitous, he told many things which was like a tale. The rivers like Sunkoshi and Bhotekoshi were the primary source for hydropower stations.We went to see the FM radio stations also and toured the place. There were wires and connecting poles around the station building. Inside were the recording studio and few technical departments that operated the telecast of programs in the air. I was having such a beautiful time in Sindhupalchowk that I didn’t realize my trip was coming to an end. Just before leaving, I handed the gift I had brought to him and to my surprise, he also gave me his token of appreciation and said he had wonderful time with me; he had only a month before his year end examinations. I wished him all the best and he insisted me to come again. I departed from his love of friendship and warm hospitality and came to Kathmandu in the evening. Went inside the home and visited my Parents and told the exciting stay in my friends’ house and places we visited together and also showed them the present I got which is for my keepsake as a remembrance to Sindhupalchok and our true friendship. Steep mountains and narrow roads in the Sindhupalchok District have drastically slowed rescue efforts. People depend entirely on agriculture for their survival. Since the district is hilly, the land is not very fertile, and the yield is very low. The cheapest way to get from Kathmandu to Sindhupalchowk District is to drive. Many NGOs and INGOs are working in the district in order to improve the living standards. There are more than 25 private schools in the district and more than half dozen colleges offering bachelor's degree in Sindhupalchok. More than 25 schools are running +2 level programs. 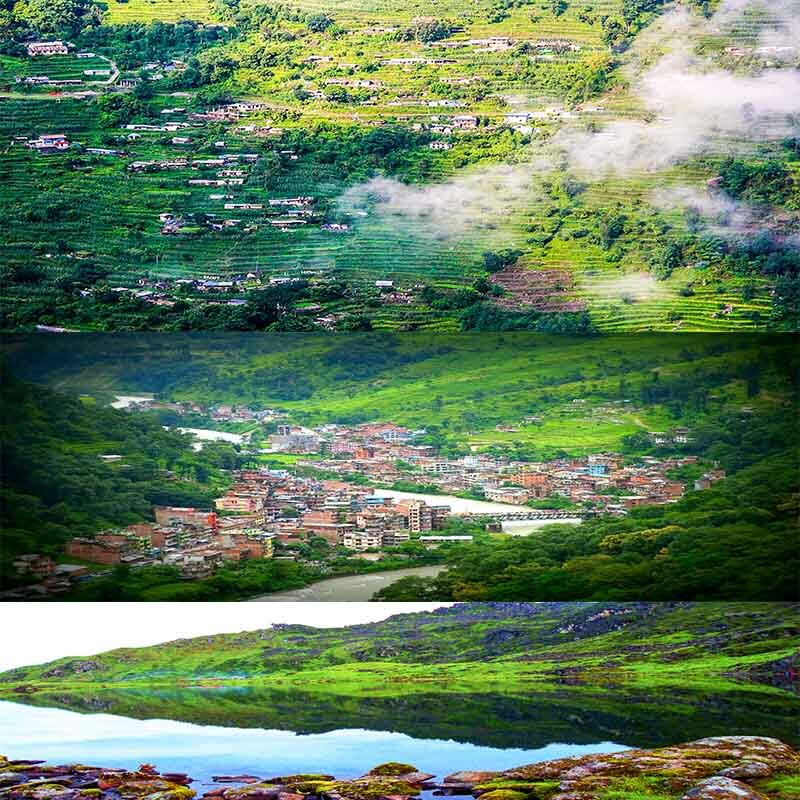 Tourist attractions are places like Helambu, Panchpokhari, Tatopani, Gaurati Bhimeswor Mandir, Bhairavkunda, Dugunagadi, Jugal Himal, Gangjala Pass, Bhemtang, Palchok Bhagawati, Patal Cave, Tripurasundari Temple, Bank of Sunkoshi and Indrawati Rivers, Tamche and Ghunde and Paty Pass.